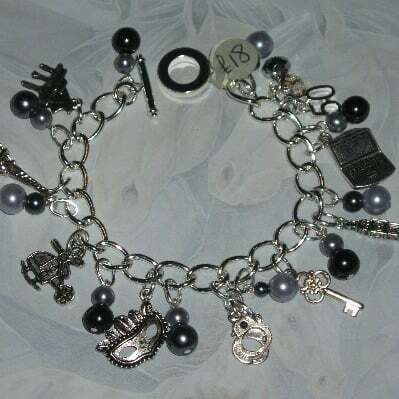 50 Shades of Grey Charm Bracelet. 50 Shades of Grey handmade charm bracelet just like Ana's birthday gift from Christian, loaded with piano, Eiffel tower, Charlie Tango helicopter, mask, handcuffs, key, Big Ben, computer, 50 charms and lots of silver and grey glass pearls. Silver plated chain bracelet with toggle clasp is 7.5" long. Every bracelet is handmade to order. You can now choose to have a sterling silver chain. This bracelet will have more charms and look slightly different as it has more links to fill.